61cm X 47cm. Aquarelle on paper. 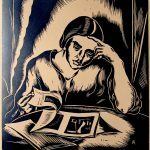 Please compare to the woodcut „Reading Woman, 1926“ in section: „Graphics and Prints“. Christian Arnold was born in 1889 in Fuerth. During WWI he served as soldier and was injured. the „Vereinigung für junge Kunst“ During the Nazi regime he was expelled from the „Künstlerbund Bremen“ and received an exhibition ban. He remained in inner emigration. He was arrested twice through the Gestapo for refusing the Hitler salute and for anti-nationalist statements- which was considered high treason. About 1/3 of his oeuvre was destroyed in an 1944 bombing. 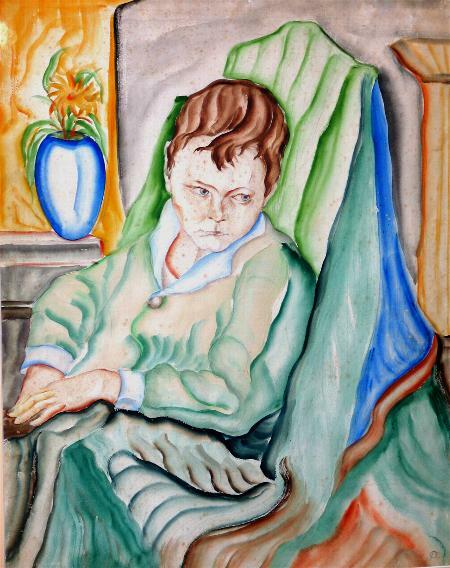 After the war he continued to work as painter but suffered from severe health problems. Arnold died in 1960 in Bremen.